Raphael Bailé was born in Algeria. He was obliged to leave his native land for France in 1962 at the age of three. A lonely and inhibited teenager, he set out studying literature and tried acting to fight off his shyness. He made his début in a new company in Aix-en-Provence and started ballet dancing (his childhood’s dream) when he was twenty-one. He worked relentlessly with principal dancer Itchko Lazarov and finally got a grant to study at the Cannes’ International Centre. 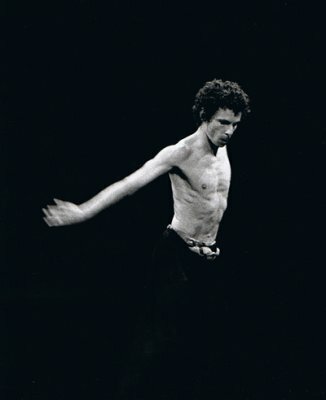 In 1985, he was hired by the Ballet Théâtre d’Aquitaine and quickly started performing solo with them. Unfortunately, two years later, injuring his Achilles tendon put an end to a promising career. Unable to dance, Rafael Baile decided to start training as a body psychotherapist. He looked for a spiritual path in Buddhism, then his fascination for “Mother’s Agenda” and later “Talking with Angels” guided his life and encouraged him to dance again. Hungry for new choreographic languages, he set out exploring other techniques such as African Dance, Free Dance, Butoh or Sacred Dance… in search for the original meaning of dance. He makes himself known by inspired choreographies with a mystical aspect, always looking for a living spirituality in the body, just like shamans and Sufis. 1995 “Talking with Angels” (from G.Mallasz’documents) was performed at the Abbaye de Montmajour in Arles. It laid the foundation of biodynamic dance. 1996 « Saint Francis’ song » was created for the Aix-en-Provence festival. 2006 « Fallen Angel » is a video recorded performance presenting his work around guided movement. Ever since his first 1993 interventions with a group of psychotic patients at the psychiatric hospital in Aix-en-Provence then in Valence with his clients, Rafaël Baile managed to define and structure his therapeutic, choreographic and spiritual practice based on the organic laws of the body in motion. These laws synthesise the main aspects of the great body practices (such as yoga, martial arts, dance) through a mainly biodynamic approach.